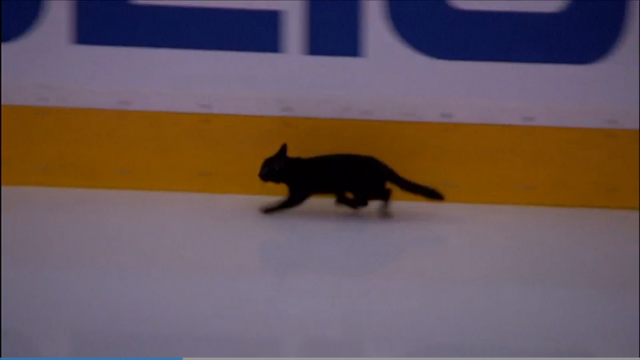 As many of you will know, before the opening game of their second-round series with the Nashville Predators a couple of weeks ago, a black cat emerged from the San Jose Sharks bench and ran across the ice. She was rescued under the stands and taken to the local Humane Society where she was dubbed Jo Paw-velski after Sharks captain Joe Pavelski. If you haven’t seen it, you can check out the clip on YouTube. Jo has now found a permanent home, having been recently adopted by a family (fittingly enough) on Friday, May 13! With the little black cat as their unofficial mascot, San Jose got past Nashville in seven games. The Sharks are now tied 1-1 in the Western Conference Final with St. Louis after a big win last night. Who knows how much of this can be attributed to their feline friend, but it turns out that black cats have a long history as good luck charms in the NHL. 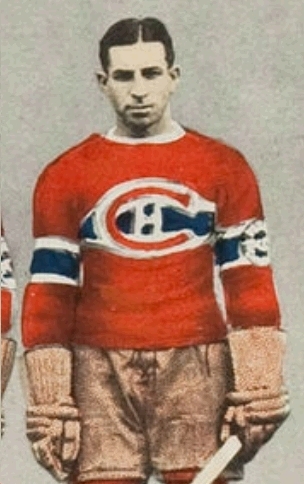 Some of you reading this will know of Johnny Gagnon, who spent most of his ten-year career in the NHL from 1930 to 1940 playing with the Montreal Canadiens. He was known as “Black Cat,” supposedly because of his jet-black hair and piercing eyes – or perhaps because of his cat-like reflexes. Gagnon spent the early part of his career playing right wing on a line with Howie Morenz and Aurele Joliat, and actually scored the first goal in the 2-0 win I wrote about last week that gave the Canadiens their second of back-to-back Stanley Cup wins in 1931. 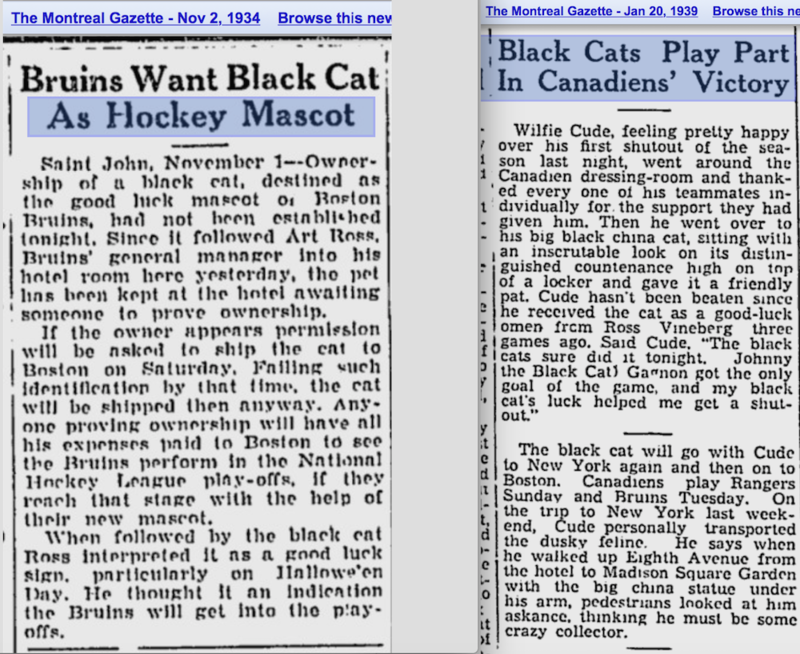 Interestingly, Gagnon’s coach in Montreal – Cecil Hart – had some sort of thing for black cats, and it had proved lucky for the Canadiens in the playoffs in 1930. 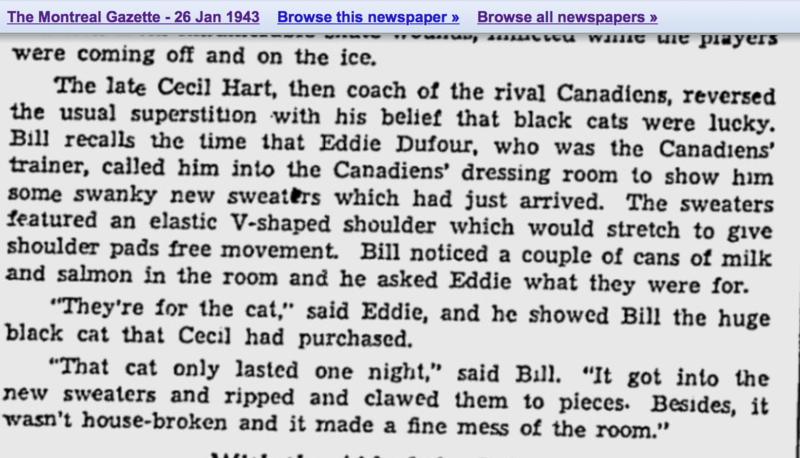 According to a story in the Montreal Gazette on April 1, 1930, Hart had come across a large black cat under the stands at the Montreal Forum before the Canadiens and New York Rangers headed out for a fourth period of overtime a few nights before. Hart patted the cat for luck and Gus Rivers scored a few minutes later to give the Canadiens a 2-1 victory. Whether or not the cats made a difference, the Canadiens went on to score a surprising Stanley Cup sweep of a Bruins team that had been one of the greatest in hockey history during the 1929-30 season. Thanks for an entertaining piece. I remember stumbling onto that story years ago and thought it was ironical. And Hurrah for Jo Paw-vleski!!! I wonder how Jo even got there???? I guess that is for her to know only…. How can I not get hooked by a tale of lucky black cats? You always come up with these great angles on hockey Eric.